"Nature is the foundation for all the arts, sciences and technology; that is, all the gifts of civilization." 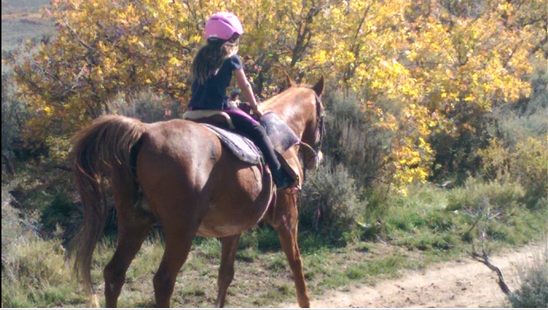 "Nature’s first requirement for the child is love of activity coupled with the desire to accomplish things. The second fundamental requirement is independence. Finland's educational model is based on direct interaction with Nature. The Friluftsliv ("free-air-life") philosophy plays a vital role in Finland's educational system, which consistently ranks as one of the world's top three countries in academic performance. The environment must be orderly, peaceful and beautiful to foster the child's need for and to develop the sense of aesthetic. All furniture is child-sized and arranged for freedom of movement. The self-educating materials are an integral part of the prepared environment. The materials have a permanent place in the environment and are easily accessed so independence is possible. A spiraling curriculum is used. Children work from the "Big Picture" and then move toward increasing levels of detail and complexity. This is the natural learning process. It is the way the child sees the world. Materials are matched to each child's stage of development as all children go through the same stages though at different rates. Children move at their own pace so that skills can be easily absorbed and practiced to mastery. Each child is perfect in the moment and is met exactly where they are developmentally. Education at Another Way is totally individualized. Self-education is self-motivating. External rewards from praise to tokens are not required. The motivation is intrinsic. 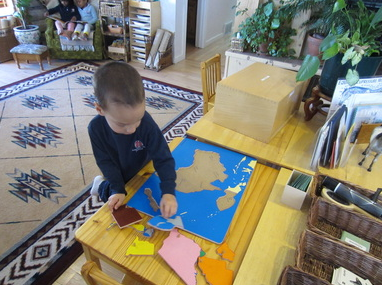 The purpose of the materials in the classroom is to give order to the impressions the child already has. Skills and concepts move from concrete to abstract. 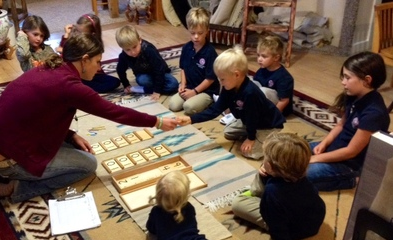 The Montessori self-educating materials at Another Way are matched to the child’s needs. The materials are graded not the child. Order within materials lead children to more abstract levels of understanding. The children’s own activities lead them to spontaneously discover and internalize order through the influence of order in the environment. All activities have a built-in relationship to other activities that follow at a later stage . This is termed “indirect preparation” or transfer. Learning is an active process leading to self-education. The teacher is the dynamic link between the child and the environment. External rewards from praise to tokens are not required. The teacher prepares and maintains the environment in perfect order. The teacher observes the children carefully as they work within the environment. The teacher holds the entire curriculum in consciousness. 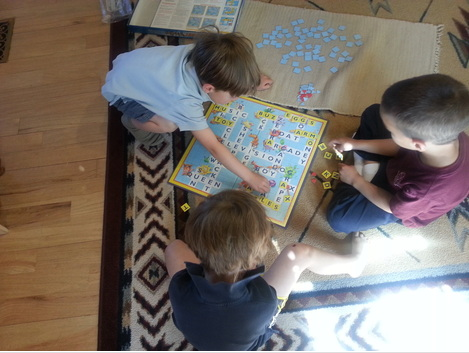 The teacher's goal is to meet each child where they are developmentally and help Awaken the Mind. We teach based on the guiding principles of respect and appreciation. Learning is joyful and activity based. Movement is the foundation of all learning. The human body is optimized by the quality of movement. In other words, in activity-based learning, "the child first moves, learns from that movement, learns to move, and then, moves to learn." Movement is fascinating to children. They move to learn about whatever attracts their attention. With a unique ability to absorb information from the environment until the age of six, they are capable of imaginably stepping into another life form to experience it. Children master an activity that engages their interest, and then, move on to the next material that attracts their undivided attention. The environment must be designed to meet the biological imperative for movement. Science is hands-on as it is not separated from the "big picture" of the formation of our world. The materials the children use to understand scientific concepts are three dimensional and hands-on. Children then move to two dimensional illustrations, films, books and computer software. The children develop a life long interest in observing nature; discovering more about the planet, its life forms and recognizing our oneness with it. 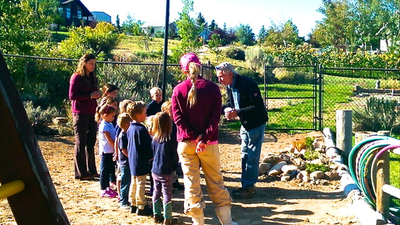 Children come to understand planet earth and her ecology on a practical level. Physically working with the globe and world map help the children see where people of diverse cultures live, work and play. Art is an integral component in the curriculum and woven into handwriting, anatomy, physiology and geometry in ever increasing complexities. Anatomy and Art are woven together as the child explores how the human body works. Children learn to see how form follows function. Comparisons are made between a horse and a human skeleton. The skeletal framework morphs to fit the function. Geometric shapes can be seen in all forms. The shape of the horse's head is rectangular, the neck cylindrical, the shoulder an oval, the body a cylinder … When the shapes are seen, drawing any form is simplified, Can you made a dot, draw a straight line and a curved line? Then, you can learn to draw anything in the physical universe. Working in an environment supporting creativity. Math actually begins with practical life and sensorial work. 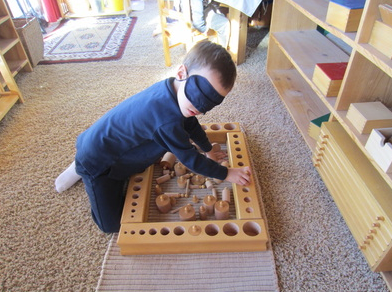 Working with these activities develops essential movements along with visual and tactile discrimination. The wonder of the world of Mathematics occurs once the child connects the concept of number values with symbols from one to ten. The key to exploring the decimal system is the knowledge of values to ten. The child is then ready to explore the Golden Bead material and new mathematical concepts. Mathematics has a beauty that quietly and subtly unfolds when one learns to truly see the wonder that we are and all that surrounds us. 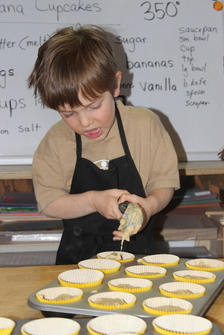 Repetition and unlimited opportunity to practice skills is built into the materials and every part of the curriculum. Perfect practice makes perfect skill development. 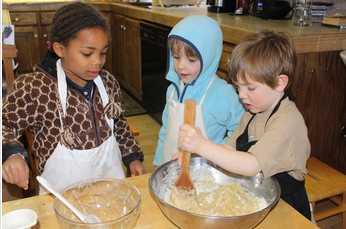 Students learn to pour, dress, clean, mend, cook, care for the environment and much more. All the Practical Life works/activities develop skills that lead to personal independence. Grace and Courtesy foster the child's ability to build and maintain powerful, loving relationships. Refine abilities until the child is easily able to recognize subtle distinctions in the environment. Working with these activities develops essential movements along with visual and tactical discrimination. 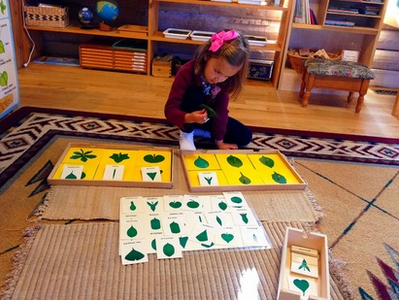 Mathematics begins with the understandings and skills developed by the child in Practical Life and Sensorial works. Under language and Intellectual Development are Science, Art, History, Mathematics, Geography and Culture. A global perspective is fostered as the roots of humankind and gifts of civilization are explored. hands-on work in these studies. Cultural studies start with the Native Peoples of North America and then extend out to European cultures and beyond based on first contact. Children begin to see that no matter how different surface appearances may seem, all people share the same basic need for food, shelter, transportation, defense and spiritual expression. These studies help awaken the child's mind to the inter-relatedness of all life and foster the biological imperative to co-create in peace, in beauty and in love. The child comes to learn that the arts and sciences are really about appreciation, gratitude and transformation. "The first essential for the child's development is concentration. The child who concentrates is immensely happy." Another Way's Primary Classroom is open-ended with self-correcting educational materials that cross disciplines and move inter-dimensionally. 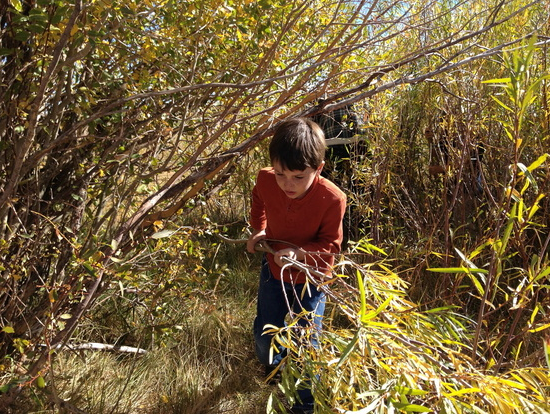 As the dynamic link between the child and the environment, we are committed to the development of the whole child. "Education is a natural process carried out by the child. it is not acquired by listening to words but by experiences in the environment."